The Ekpyrotic Universe – A Collision Before the Big Bang? 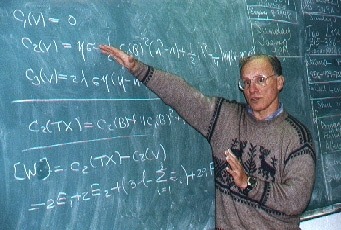 Some of the mathematical equations used by particle physicist Burt A. Ovrut, Ph.D., at the University of Pennsylvania Physics Department to "work in" the theoretical 5th dimension. Photograph © 2001 by Linda Moulton Howe. April 15, 2001 Philadelphia, Pennsylvania - A brand new theory about the creation of the universe emerged recently from cosmologists and particle physicists at Princeton University, the University of Pennsylvania and Cambridge, England. The new theory is called the Ekpyrotic Universe, from a Greek word meaning "conflagration" used to describe the universe's creation from a huge fireball that cooled down. Periodically, the Greeks thought, the process could repeat itself. Previous PostPrevious Foot-and-Mouth Disease – Why Slaughter? Next PostNext April 1986: After Chernobyl Melt Down, What Flew Over Mannheim, Germany?